Gum disease is a range of conditions involving the supporting tissues of the teeth. It has two stages known as gingivitis and periodontitis. Gingivitis is the earlier stage, affecting only the surface tissues seen in the mouth and caused by bacteria accumulation, which later form into plaque and calculus near the teeth. Once this happens, the gums bleed easily, which often occurs when you eat or brush your teeth. Without early diagnosis and treatment, gingivitis advances to a more serious form of gum disease called periodontitis. The latter condition affects the deeper tissues like ligaments, root surfaces and jawbone. Periodontitis can proceed to complications such as receding gums, abscesses and trench mouth including tooth loss and even bone loss. Everyone can experience gum disease at some stage in their life. Statistics show that over 70 percent of adults have some form of gum disease. Because of this, it is crucial to know what causes this condition and how Mernda Gum Treatment can help you eliminate the threat of gum disease. The major cause of gum disease is plaque. Bacterial plaque is a highly adhesive, clear film that keeps on forming on your teeth. Your immune system attempts to eliminate plaque through an inflammation response as seen by the colour and texture of the gum around tooth, indicating redness and swelling. Smoking makes your mouth dry and acidic, which then allows more bacteria to flourish and multiply inside your mouth. If there are more bacteria in your mouth, then you’re at greater risk for gum disease. Poor nutrition means you are not getting enough vitamins and minerals, which can make you highly susceptible to the condition. Vitamins A, C, D including folic acid and zinc are all essential in maintaining good gum health. Health conditions and illnesses can cause damage to your gums. This includes diseases such as diabetes, cancer, and even stress. In addition, some types of medications can cause dry mouth, and without enough saliva, the gums are at risk of bacterial infection. Hormonal changes in women can also lead to gum disease because this physiological changes in females can make the gums more sensitive. Once the gums are hypersensitive, they are more exposed to infection and gingivitis. Gum disease is a serious condition and treating it at its earliest stage helps you prevent further complications linked to the disease. In the event you are diagnosed with gum disease, your dentist at United Smiles Dental will provide you with a sophisticated gum disease treatment program. The aim of the treatment is to reduce gum inflammation, at the same time, reverse the effects of gum disease. 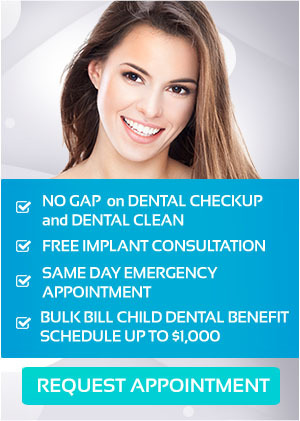 The program encompasses professional teeth cleaning, oral hygiene education with correct methods and techniques and repair of other dental anomalies that may have contributed to or resulted from this condition. Your Mernda dentist highly recommends that underlying medical problems must also be treated to guarantee complete success in the gum treatment program. With the assistance of your trusted dental team at United Smiles and our first-rate gum disease treatment, you need not worry about gum disease any longer. United Smiles is equipped with the latest in dental technology to provide everyone with the best dental care possible, eliminating different oral health problems such as gum disease. Our experienced team is looking forward to showing you how our gum treatment program can help you achieve superior oral health and improved overall wellness as well. Book your appointment online or call us on (03) 8682 8658. For HCF and CBHS, claim your PAY NO GAP OFFER on dental check-up and clean. Bulk Bill Child Benefit Schedule Up to $1,000. United Smiles is conveniently located in the heart of Mernda Village, serving patients from Doreen, Beveridge, Whittlesea, Mernda and from all Melbourne metro areas. Our dental office includes an ample parking available at the rear of the building. Wheel chair access is also available from the front of the building and all of our surgeries have been built to accommodate this.